A few weeks ago, I wrote a blog post about the one of the most popular and highly effective body weight exercise, the Pull-Up. The complement exercise to the pull-up is the parallel bar dip. When it comes to body weight training, these two inevitably go hand-in-hand like Peanut Butter & Jelly, Starsky & Hutch, Thelma & Louise, Andre 3000 & Big Boi, Butch Cassidy & the Sundance Kid (I think by now you get the point), etc. The parallel bar dip is an exercise that uses the muscles of the pectoralis major, triceps group and anterior deltoid. For the remainder of this post, I’ll refer to this exercise as simply ‘the dip’. It is important not to confuse the dip with bench/chair dip which is strictly a triceps exercise. Although both movements require extension of the arms, the dip places a greater demand on the upper body. For those not familiar with execution of the dip, it requires a set of parallel bars that are shoulder-with apart. Most commercial gyms have designated apparatus for this exercise, though any two parallel bars that are shoulder-with apart (like the ones seen in recreational parks and playgrounds) will work just fine. Although some of the dip bars may differ in angles and inches apart, they generally don’t affect performance of the movement. 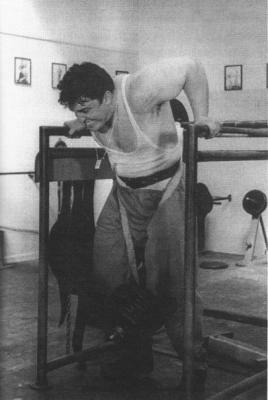 Set-up for the dip begins with both hands fully extended (locked elbows) on the bar with the body supported by the hands and suspended. The movement is initiated by eccentrically flexing the elbows via lowering of the body. This phase is usually aided by gravity so it requires little to no effort. However caution must be used during descent because a fast and sudden dip will most likely lead to injury to the shoulder, elbows and/or pecs (more on this later) over time. A 90-degree elbow flexion is considered to be an ideal bench mark on the depth of the lowering phase. Once that position is reached, the elbow extensors must now contract concentrically to push the body back to its original starting position. This is the phase of the movement that requires by far the most effort. Anatomically speaking, the dip can be performed with virtually any upper body movement. It is generally thought of as a triceps exercise by many but as I mentioned before, it also works the chest and shoulder. Body position impacts the amount of fibers that get recruited in the pectoralis major. Generally, a slight forward lean will engage the pecs to a great extent. Regardless of the angle, the long head of the triceps will receive a good amount of work. Because both the traditional bench press and the dip work identical muscle groups, they are usually paired up in most strength training programs. Whether you’re a regular avid lifter, bodybuilder or powerlifter, the dip is an effective exercise in sculpting, strengthening and adding mass to the upper body. So what if you’re unable to perform a single dip using your body weight? As with the pull-up, the dip can be regressed and progressed for body adaptation. The most basic regression comes in the form of the parallel bar dip assisted machine. I don’t know of a commercial gym or health club that doesn’t have this machine. And just like with the pull-up, assistance (via selectorized resistance) allows the individual to perform the movement with a lesser challenge. Another common regression is having a partner hold on to the legs during the movement allowing for lesser weight in the trunk musculature being pushed. Also, because gravity is constantly pulling the body down during descent, having someone hold on the legs eliminates this and allows the individual focus on pushing back up. A strength bands can also be used as a regression but requires a much more difficult set up. A band of medium or heavy resistance is looped over both parallel bars forming what looks like an upside down semicircle. Both knees are placed gently over the band which stretches down during descent and helps to pull a person back up as it undoes its elasticity. This regression can be effective for some, however caution must be used when mounting off the band. As great an exercise the dip is, the potential for injury is very high. Dipping beyond the 90-degree elbow bend has been linked to injuries affecting the wrist, elbow (tendonitis) shoulder (acromioclavicular joint and rotator cuff muscles) and tears in the triceps and pectoralis major muscle groups. The shoulder joint becomes vulnerable to extreme tension when the body descends too deep because the joint is biomechanically misaligned at that point. Remember that the ball and socket joints of the shoulder and hip are the most vulnerable to injuries because of their multiplanar feature. This is not to scare you away from doing the dip but simply to inform you of the injury risks that come along when done with improper form, too much additional resistance is used and performing the movement on too many days with inadequate rest and recovery periods in between. 1. The dip is one of the most effective pushing body weight exercise for strengthening and aesthetically developing the upper body. It is often paired with the pull-up/chin-up and makes for an ideal ‘push-pull’ superset. 2. The dip can be performed by men and women, young and old and people of all sizes. The individual performing the movement must use proper technique and a variation type that matches his/her abilities. 3. The training recommendation for strength, hypertrophy and muscular endurance is the same as basic strength training and powerlifting. So if your goal is size and strength in the triceps and chest, the repetition range should be 1-10 with a moderately heavy load. If endurance is your goal or you’re just trying to maintain the lean muscle you already have, 12-20 repetitions with a light load or just body weight is an ideal rep range. 4. Flexion of the elbow during descent should not be deeper than a 90-degree bend. There are some who go deeper than this angle and never experience any problems while there are those who never descend close to 90 degrees and still get injured. There is inconclusive evidence to support whether going past 90 degrees is dangerous. In fact, injuries from weighted parallel bar dips are very few, one study shows. Err on the side of caution when doing the dip and listen to your body. 5. The parallel bar dip should not be confused with the bench/chair dip, which is strictly a triceps exercise.